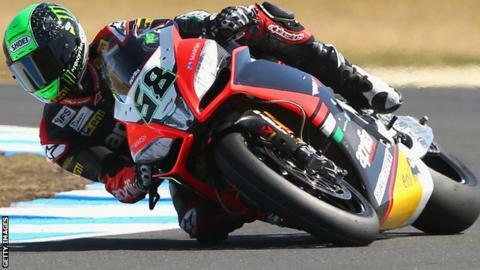 Northern Ireland rider Eugene Laverty has made a winning start at Phillip Island in his attempt to become the 2013 World Superbike champion. The 26-year-old from Toomebridge, County Antrim, won the second race in Sunday's series opener in Australia. Earlier Laverty, now living in Monaco, had finished runner-up to Aprilia team-mate Sylvain Guintoli in the first race. Jonathan Rea from Ballyclare finished eighth in both races. Guintoli's victory in race one was the fourth of his career, and he secured it by overtaking Laverty on lap 15 and holding off the rest of the field, leaving Laverty and another Aprilia rider, Michel Fabrizio, to battle it out for second. Laverty waited until the last lap to make the perfect move on the Italian at Lukey Heights to secure the runners-up spot. Ducati Alstare rider Carlos Checa - who secured pole on Saturday - exited the race after lap 14 after colliding with Marco Melandri, with his injuries forcing him out of the second race. Laverty, sixth in last year's championship, ended the second race strongly to join his team-mate at the top of the standings, while Melandri finished third behind Guintoli. The Northern Irishman recorded a fastest lap of one minute 31.168 seconds on lap 20 to pass Melandri and Guintoli to move into first, where he stayed.